Particle and Surface Sciences are pleased to introduce the Micromeritics AutoChem 2920 Automated Catalyst Characterization System - A catalyst characterization laboratory enclosed in one cabinet. The AutoChem II 2920 is a fully automated chemisorption analyzer that can provide your laboratory with the ability to conduct a comprehensive array of highly precise studies of chemical adsorption and temperature-programmed reactions. The AutoChem II 2920 utilizes the dynamic (flowing gas) technique to perform chemical adsorption analyses of active sites on the surface of the sample material. The analysis methods include temperature-programmed reactions (desorption, reduction, and oxidation) and pulse chemisorption. 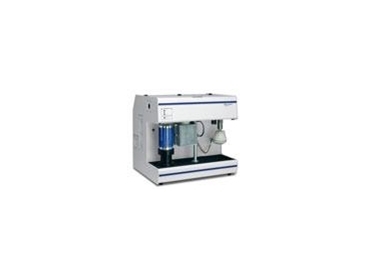 The instrument also may be used to perform single-point BET surface area analyses by physical adsorption. The flowing gas technique is used in two different modes. In one, an active gas (pure or mixed with a carrier) is flowed through the sample bed to pretreat quickly the sample for subsequent analyses. Another mode utilizes the titration technique in which small, reproducible volumes of a reactive gas such as hydrogen, oxygen, carbon monoxide, sulfur dioxide, or ammonia are injected into an inert carrier gas stream that passes through the sample bed. Vapors such as pyridine or isopropyl amine can be introduced into the carrier stream by the vapor generator, which allows for the precise volume dosing of a vapor as an analysis gas. In either mode, matched thermal conductivity detectors compare the sample stream to a reference stream of pure carrier gas to quantify changes in gas composition resulting from reactions in the sample cell. The AutoChem II 2920 is a high-resolution (up to 10 data points per second), fully automated instrument that can be programmed to perform a user-defined sequence of pretreatment and analytical tasks. Temperature can be controlled from sub ambient (-70 °C) to 1100 °C with programmable heating ramps and plateaus. Independently heated compartments maintain valves and gas lines at controlled temperatures so vapors can flow through the system without condensation. Special external ports also allow products from the reaction chamber to be directed to a mass spectrometer or other external detector. Analyses performed by the AutoChem II 2920 are TPD, TPR, TPO, Pulse Chemisorption, and BET Surface Area. Graphic reports for BET surface area, pulse chemisorption, heat of adsorption, and more. In addition, it has an integrated Grams/32 peak editor package which provides peak selection and editing, integration, data smoothing, rescaling, and overlay capability. Particle & Surface Sciences also offer a wide-ranging programme of support solutions, including installation and service of all instruments by factory trained technicians, an Analytical Laboratory and a Sales Department to assist with your enquiries. PsS will be running a series of seminars across Australia during 2009. Please visit our website for more information on the locations.